Harissa Chicken. 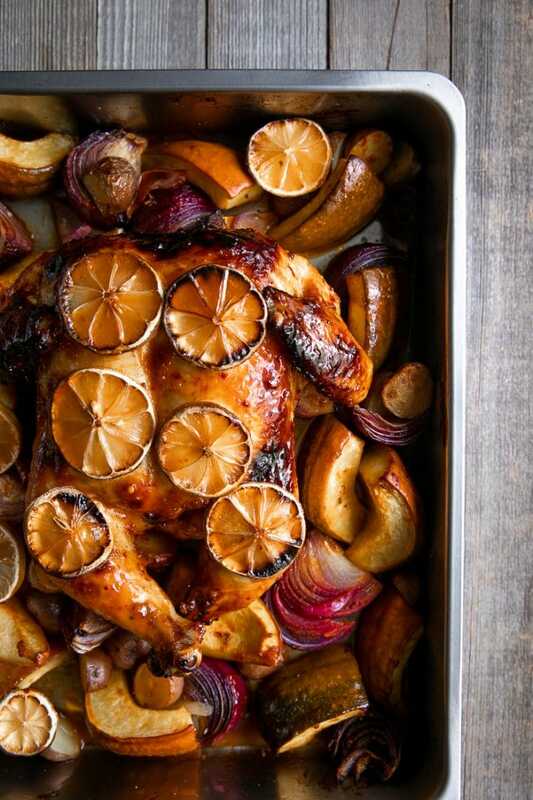 Tender and juicy whole spatchcocked chicken smothered in a sweet, spicy, and crazy flavorful sauce made from harissa paste and apricot jam baked to perfection with onions, potatoes, and acorn squash. 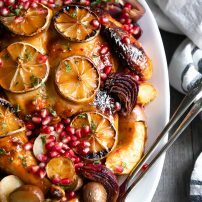 Enjoy this Baked Harissa Chicken as an easy weeknight meal or with friends for a special weekend gathering. As one of the leanest and most economical sources or animal protein, chicken is a dinner favorite in my house (translation- chicken is my dinner favorite). Whenever I ask my 5-year-old what he wants for dinner his list typically consists of sausage, filet mignon (which is weird since I’ve never made this for him), frozen blueberries, mac and cheese, and a pumpkin smoothie. All at the same time. My husband? He happily eats anything I place in front of him. Inspired by this homemade harissa paste recipe and these delicious lamb tacos, I thought it would be fun to roast a whole chicken with all the leftover veggies I had sitting on the counter. In my case, these veggies included red onion, small potatoes, and an acorn squash. Harissa is a spicy chili paste widely used in North African and Middle Eastern cuisine. Most harissa recipes are made with a blend of hot chile peppers, garlic, olive oil, and spices, like cumin, coriander, and mint. Tomatoes, or tomato paste, and rose petals are also commonly found in harissa. Becoming more and more popular over the past several years, you can pick up a jar of premade harissa paste from many supermarkets, or make your own! Why did I add the apricot jam? I am all about different flavor combinations and the combination of the sweet apricot jam with spicy harissa paste is one of my favorite combinations. Sweet, spicy, and savory all rolled into one. Squeeze a little fresh lemon juice on top with fresh chopped parsley and, well, I can’t imagine anything better. So, I have butterflied a chicken exactly one time. Before I share a step by step video or tutorial, I thought I should practice a few more times. That said, it’s a fairly easy process. If in doubt, ask the butcher at your local market to do it for you. The guys at my market know me by name thanks to my neverending questions and unusual requests. Ok, so let’s make some delicious harissa chicken. Prepare the chicken. Remove the chicken backbone by placing the chicken breast-side-down on a clean work surface. Using kitchen shears, cut along one side of the backbone, starting at the thigh end. Rotate the chicken 180 degrees and cut along the other side, removing the entire backbone (discard or save for stock). Flip the chicken over, open, and press firmly on the breastbone to flatten. Prepare the sauce. In a small bowl whisk together the harissa paste, apricot jam, 2 tablespoons of olive oil, salt, and pepper. Set aside. Prepare the vegetables. Chop and transfer the vegetables to a large roasting pan. Drizzle with the remaining 1 tablespoon of olive oil. Toss to coat. Season with salt and pepper. Transfer and season the chicken. Transfer the butterflied chicken directly on top of the vegetables and season lightly with salt and pepper. Rub the entire chicken with half of the harissa apricot jam mixture. Set aside the remaining sauce for later use (take care not to cross contaminate with the raw chicken- aka do not double dip your fingers into the mixture if they had previously touched the raw chicken). Place the lemon slices on top and around the chicken. Bake. 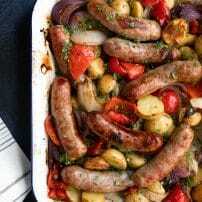 Tent the roasting pan with foil and bake for 15 minutes before removing foil and baking for an additional 25-35 minutes, or until internal temperature reaches 165 degrees with a digital thermometer and the juices run clear. Add the remaining harissa apricot mixture. Remove the chicken and vegetables from the oven and brush with remaining harissa apricot mixture. Allow chicken to rest for 5 minutes before serving. Garnish. 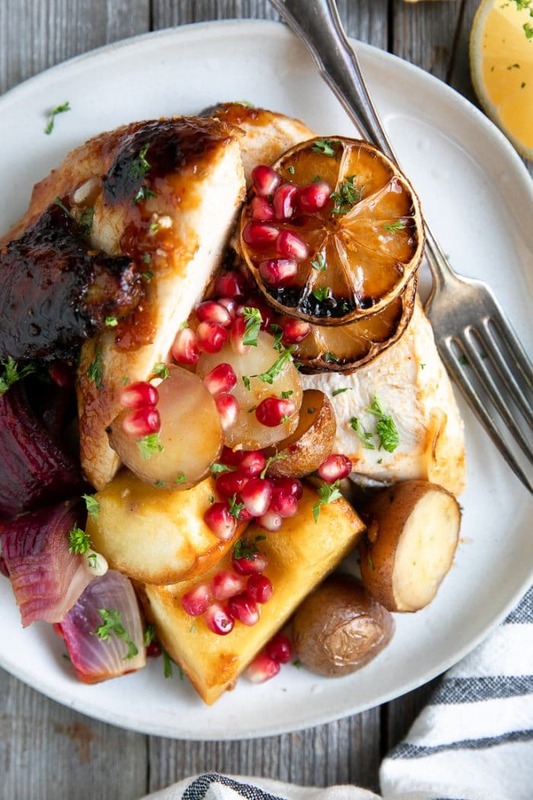 Serve garnished with pomegranate arils and fresh chopped parsley, if desired. If you prefer breast meat or thigh meat, feel free to skip cooking an entire chicken and add your favorites instead (please note that cooking times may vary). Replace acorn squash with the more familiar butternut squash or even pumpkin, if desired. Feel free to play with the jam to harissa ratio to find what works best for you. More harissa will make a spicier chicken. 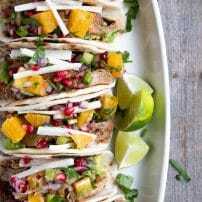 Enjoy leftovers fried together with eggs or rolled in a soft flour tortilla with sweet pomegranate salsa. Kitchen shears. If you plan to butterfly your own chicken, then you will need a good set of kitchen shears, since, you know, you’ll be cutting out the backbone. Roasting pan. You could probably get by with a large jelly roll pan, but given the number of vegetables plus chicken going into the pan, you want a sturdy place of all that goodness (not to mention juices). Digital meat thermometer. Trust me guys, if you plan to cook meat more than once, get a digital meat thermometer. I remember when I was in college and I didn’t use a digital thermometer…by the end of cooking, my chicken was either overcooked, undercooked, or so cut into that it looked abused. Digital thermometers are inexpensive and probably one of my top 5 kitchen must-haves. 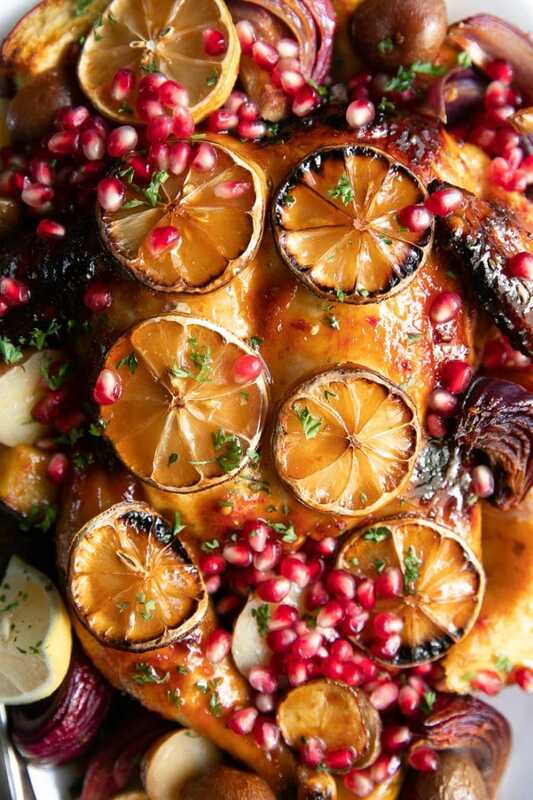 If you try cooking this Harissa Chicken, please leave me a comment and let me know! I always love to hear your thoughts. 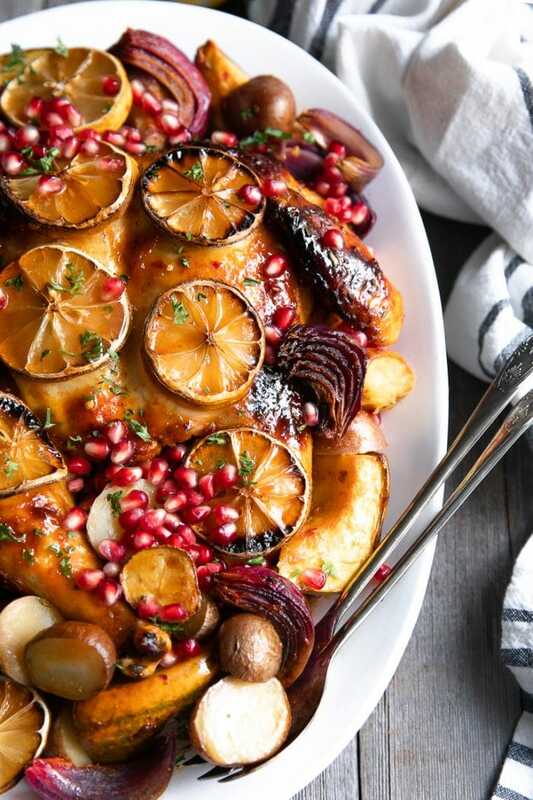 DON’T FORGET TO PIN AND SHARE THIS BAKED HARISSA CHICKEN RECIPE TO MAKE FOR A FLAVORFUL AND COMFORTING DINNER THE WHOLE FAMILY WILL LOVE. 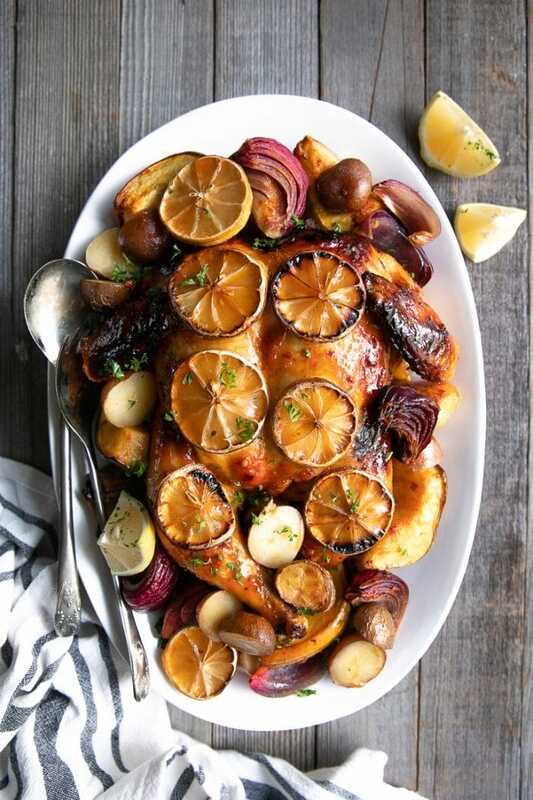 Tender and juicy whole spatchcocked chicken smothered in a sweet, spicy, and crazy flavorful sauce made from harissa paste and apricot jam baked to perfection with onions, potatoes, and acorn squash. 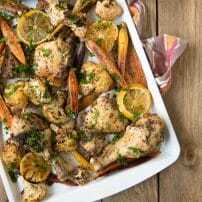 Enjoy this Baked Harissa Chicken as an easy weeknight meal or with friends for a special weekend gathering. Prepare the chicken. Remove the chicken backbone by placing the chicken breast-side-down on a clean work surface. Using kitchen shears, cut along one side of the backbone, starting at the thigh end. Rotate the chicken 180 degrees and cut along the other side, removing the entire backbone (discard or save for stock). Flip the chicken over, open, and press firmly on the breastbone to flatten (or you can ask your local butcher to do it for you). Transfer the butterflied chicken directly on top of the vegetables and season with salt and pepper. Rub with half of the harissa apricot jam mixture (approximately 4 tablespoons). Set aside the remaining sauce for later use (take care not to cross contaminate with the raw chicken). Place the lemon slices on top and around the chicken. Tent the roasting pan with foil and bake for 15 minutes before removing foil and baking for an additional 25-35 minutes, or until internal temperature reaches 165 degrees with a digital thermometer and the juices run clear. Remove the chicken and vegetables from the oven and brush with remaining harissa apricot mixture. Allow chicken to rest for 5 minutes before serving. Serve garnished with pomegranate arils and fresh chopped parsley, if desired. Enjoy. Wow this looks so great! I love harissa but I have yet to use it on chicken. Cannot wait to try this at home. Thank you for sharing!